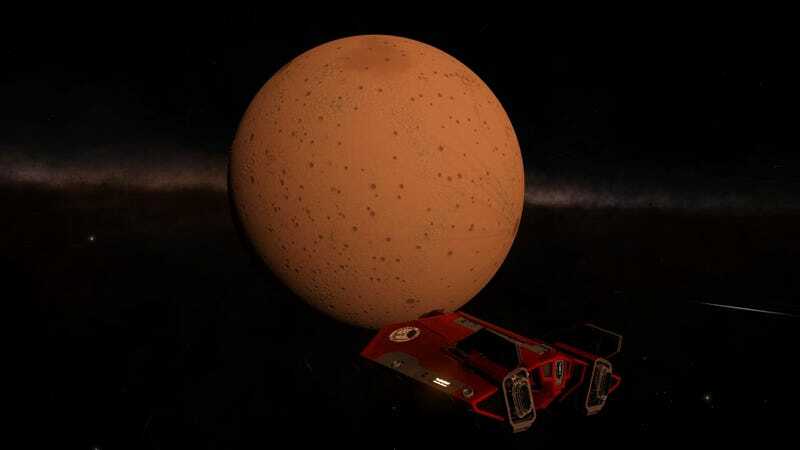 Last year, following the release of its 2.2 patch, Elite: Dangerous players started noticing something weird: some of the game’s planets, normally detailed and full of alien colour, had started looking a little more drab. While ice planets were unaffected, worlds with high metal content had turned beige everywhere you looked, and even some rocky planets suffered the same fate. Via Eurogamer, enough noticed that a thread on the game’s forums was started, tracking a process where players would log planets they found to be suffering from an “infection” that not only rendered them in the most boring colour in the universe, but had also stripped them of much of their former geometry. Up top, some nice detail inside a crater. Below, almost no detail. Images can only do so much to show what was going on, though, so here’s some video by ObsidianAnt. While it was always possible that this was being done on purpose, with this being a game full of weird secrets and all, turns out the reason for the great emblandening of the universe was down to...a very human misunderstanding. My apologies for not responding sooner, this issue has been on my list to chase up for a while. The reason for the difference being observed on the rocky worlds is the change to the new material system - in theory this is more accurate as it uses the chemical properties to determine the colour (obviously I’m simplifying a bit here! ), however the problem is that those colours were based on Earth standard colouration for those materials, and most of those are beige/brown rather than the colours you might observe in the myriad of other possible conditions. We’re currently working on a more flexible material system, and this will necessitate a fresh balance pass on these. These changes will be introduced in a future patch/update to the game (though not 2.3). Those who actually enjoy their space planets looking like sand, best get your footage capped while you still can.